In my first blog post I mentioned that my new job is to study stem cells. A commenter asked if I was conflicted about working with "little baby-bits". Remarkably, no embryos are required. This is because our lab uses adult stem cells. The use of adult stem cells was a surprise to me, because until I began this job I'd assumed that adult stem cells were just a talking point for conservatives who didn't want to admit to being against a promising medical treatment, like when liberals talk about "clean coal". It turns out that Rick Perry -- a huge fan of stem cells -- was actually right in his insistence that embryonic tissues would become obsolete. If you have a gong you bang whenever Rick Perry is correct about a matter of science, now would be your chance to enjoy this rare opportunity. Most of us learned in school that cells grow by dividing. This, however, is a massive oversimplification. Bacteria and cells in an embryo proliferate by dividing, but your blood cells don't divide to make more blood cells. If they did, you'd have leukemia. The blood cells in your body are destined only to carry blood until they expire. They have a defined lifespan and are incapable of dividing. They are mortal. Instead, your blood cells are produced by Hematopoietic stem cells. These are the cells in your bone marrow that make new blood. Unlike most cells in your body, stem cells possess the ability to renew themselves. They have no set lifespan. These cells are literally immortal. There are other stem cells in your body, such as those that are constantly regenerating your skin. This is wonderful news. 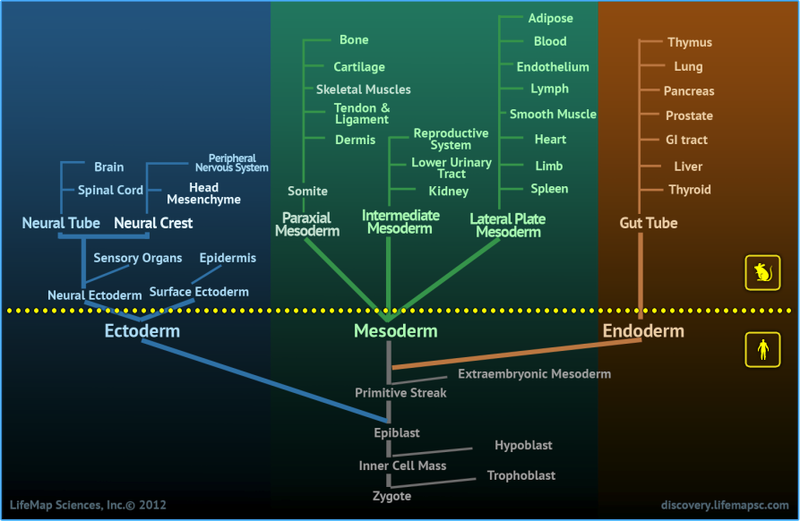 All the cells in your body have the same DNA. They behave differently because they are programmed to turn certain switches on and off. Certain cells in the pancreas are programmed to make insulin when they encounter sugar in the blood. Certain cells are programmed to make new skin when you are cut. In the last ten years, we've unlocked many codes. These codes let us reprogram cells. Among other things, this has allowed us to lift the factor which previously limited adult stem cells. It used to be that only embryonic stem cells could become any kind of cell in the body. This ability is known as 'Pluripotency'. When a human develops in the womb, their cells start out as embryonic stem cells and then are forced to become one type of cell or another. First they become one of the following three: either the cells of your nervous system, your bones & muscles, or your guts. If they commit to being nervous tissue, they then are forced to become skin, brains, eyes or one of many other types of nerve tissues. Skin stem cells could be used to make other nerve tissues like brain cells or retinal cells, but they couldn't be used to make blood. Blood cells couldn't be used to make a pancreas. There were limits on how far they could be reprogrammed. It took one search to find the Futurama gif above and over a dozen to find this. Thanks, Internet. Now, skin cells can be reprogrammed all the way back to before they became nerve tissue. Once we reprogram them to be pluripotent they can be anything. Besides side-stepping moral headaches, this means we can grow new tissues for living patients from their own cells, and those tissues will be genetically their own. In the near future, patients will receive replacement tissues which are indistinguishable from their original ones and require no donors. So what do I do with stem cells? Basically, two things. The first is to find new ways to produce certain types of cells. Although we've found the signals which turn skin cells into pluripotent stem cells, if we want to make the cells that produce insulin in the pancreas, we need to know what signals turn stem cells into endoderm cells -- the red branch on the right in the chart above. We then need to know how to instruct these endoderm cells to turn into foregut cells instead of intestinal cells or lung cells or any of the other possibilities. We must then know how to turn those foregut cells into pancreatic cells, and then how to turn general pancreatic cells into beta pancreatic cells specifically, which are the ones which produce insulin. In my lab, we're trying to make arcuate neruons, which are part of the hypothalamus in the brain. Each box is a different type of cells, each with their own special signals, just in this one region of the brain. We're trying to make the box labeled "AR". But why? Why do we want arcuate hypothalamus cells? This is the second thing we do. Once you have a cell type, you can experiment on it. The hypothalamus regulates things like hunger and arousal. Along with culturing normal hypothalamus cells, we're also producing hypothalamus cells using skin cells which come from individuals who suffered from morbid obesity. The hypothalamus cells will carry the same disfunctions which caused their donors to grow to 400 lbs before they were 20 years old. We will measure the cells' behavior in order to learn why some people experience these conditions and perhaps how they can be treated. What we're doing is unique because of the specific cell types and the specific diseases we study. The general approach, though -- unlock the code to produce new cell types and examine how a disease works at the molecular level -- is becoming more and more common. These are methods that Hypocrates and Imhotep could literally not have fathomed in their weirdest ancient dreams. The last ten years have produced amazing discoveries and the next ten promise even more.